Dimensions: 10 x 15 in. *Printer: Fiene used two printers during the year1928: George C. Miller in New York and Edmond Desjobert in Paris. All of the lithographs appearing in the1928 Downtown Gallery exhibition catalogue "Ernest Fiene New Lithographs," and any other works created in New York, were printed by Miller. The three 1928 circus scene lithographs not being included in the above exhibition may have been done in Paris, though Fiene didn't arrive there until December. Both the limited amount of time in Paris in 1928, and the printing technique for these works (The observed impressions are not on chine collé, a technique favored by Desjobert) supports the conclusion that they were printed by Miller, but this is not certain. 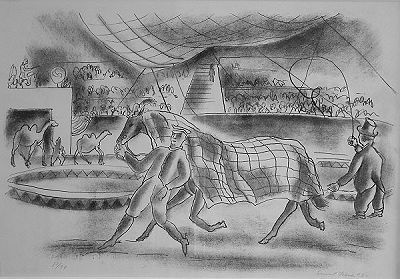 Related Works: There are two other lithographs with circus themes currently in the catalogue raisonné: (Trapeze Artists and Tight Rope Walker) both from 1928. Later in his life, Fiene painted a series of portraits of clowns, but outside of the circus context, they bear no similarity to the circus lithographs of 1928.